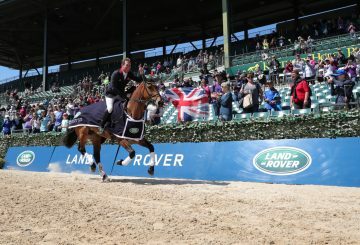 The winners will be revealed at the RoR End of Season Party on Saturday 17th November. 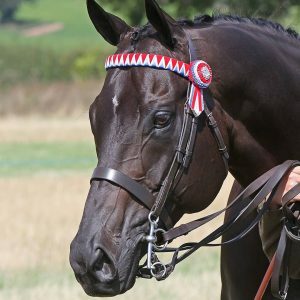 Following an online public vote, Retraining of Racehorses (RoR) can reveal the 12 finalists for the 2018 RoR Heart Awards. RoR Patron, Clare Balding OBE will choose the winner in each of the four categories and the final winners will be revealed at the RoR End of Season Party on Saturday 17th November. 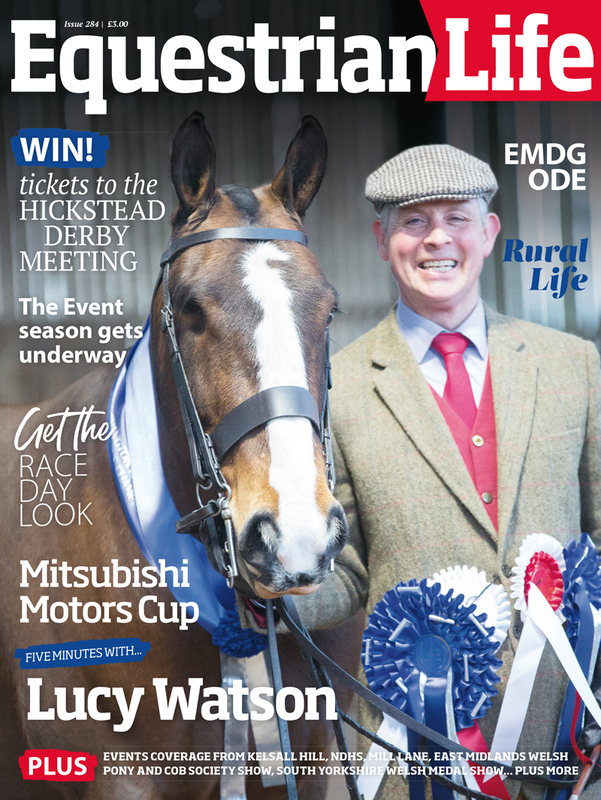 The final winners will be revealed at the RoR End of Season Party on Saturday 17th November at Doncaster Racecourse. 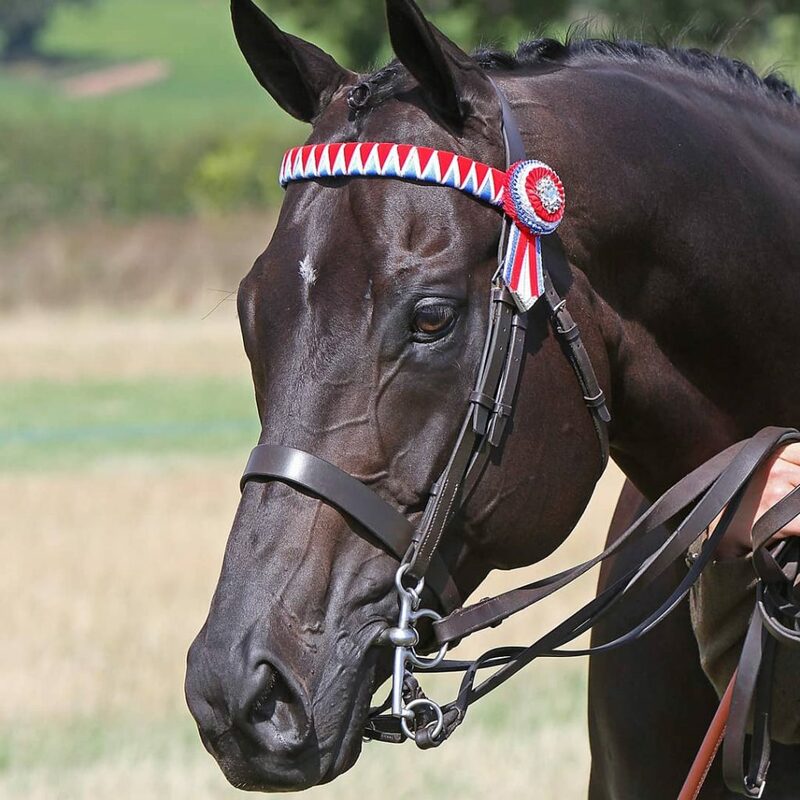 The evening is a celebration of former racehorse and will also feature the presentation of a number of other RoR Awards in eventing, showjumping and dressage won through the 2018 season. Each RoR Heart Award winner will be presented with a RoR Heart Award Trophy and a RoR rug for their former racehorse. Magical Lasso or Michael, as we call him, came into my life nearly two years ago. He was originally bought for my daughter to ride. 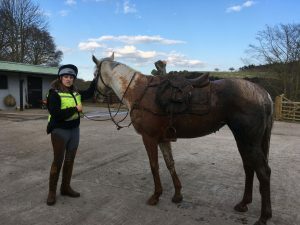 Michael showed such a willingness to learn and had such a sweet temperament we agreed that even though I was a novice, having only recently taken up riding, Michael, with his very calm nature would be suitable for me to ride. I had always wanted to ride as a child but was never allowed. Now in my 60th year and Michael in his 5th we have started a lovely journey and partnership together. This amazing horse has helped my riding progress to the point where we took part in our first ever Dressage competition a few weeks ago. Never in a million years did I think I would be able to start competing at my age! 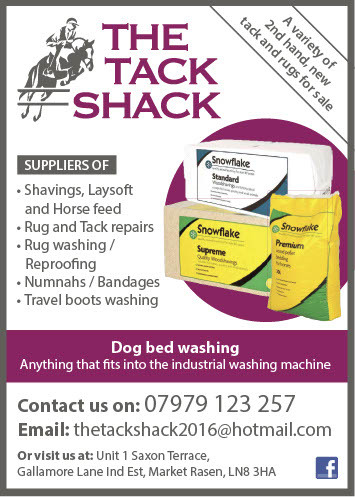 The pinnacle of our riding life came when we went to the RoR Championships at Aintree this year. It was amazing. For us it was only our third ever competition together and we gained our highest mark yet. Michael deserves this award because he is a genuine, honest and patient boy who has taken care of me and helped me realize a long-held childhood dream. He is also such a character, curious, funny and always wants to help with jobs in the field! He is so special and so loving. 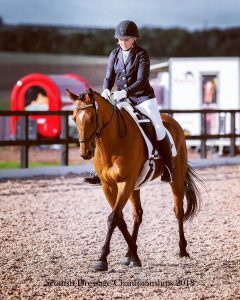 I feel privileged to own such an incredible horse like Michael- he has really transformed my life! ince owning Elsie she has honestly been a dream come true. Earlier this year we had an accident through no fault of her own when a pack of dogs ran at us she stepped backwards and fell down a ditch on top of me (first picture). But because Elsie stayed so calm this prevented further injury. My confidence was really affected and I didn’t dare ride anymore almost giving up but because of Elsie’s trusting nature she has built my confidence back and this month my dreams came true when we were crowned NAF Riding Club National Show Jumping Champions! Joeys racing name is Great Choice, and bringing him home was definitely the best decision I’ve ever made. I fell so in love with him from the moment I met him. Joey deserves this award as he is the most genuine, affectionate, warm hearted horse I have ever met. Retraining him has been a breeze as he is simply level headed and has so much compassion for any rider on his back. 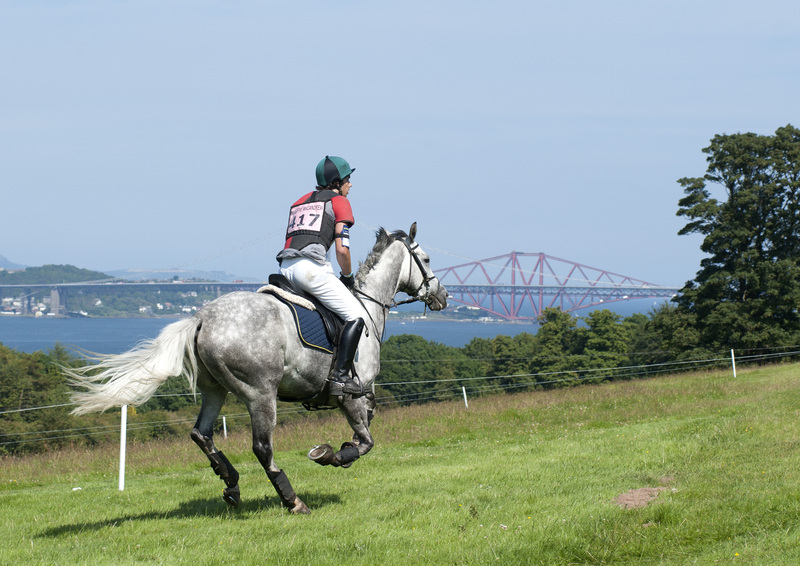 This horse will do anything for me, whether its galloping (and stopping) around the local bridle paths, or tackling a tricky cross country jump for the first time – he just takes everything is his stride and tries his heart out. He is so quiet and safe, I can let my five-year-old niece ride him solo around the arena at home! Joey suffers severely with allergies that affect his breathing and skin condition, so it’s a good job he loves human interaction as I spend hours a week covering him in lotions to make the summer bearable for him. This never gets him down though. He still greets me every morning with his ears pricked for the best cuddles. Joey deserves to win this award as he is just the nicest horse to be around. He is the perfect amount of cheeky which makes him hilarious to be around, and he is just so easy to love. He is my best friend and the bond we have is unbreakable. I promised I would give him the best possible life and nothing will get in the way of that promise. He’s my horse of a lifetime! I was given Polish Paddy (Patrick), who is only 15.2hh, in January 2004 a week after his last race, he was six-years-old. He ran 32 times on the flat and over hurdles for three trainers and won one flat and two hurdle races. After some time off I started retraining him. For the first few years we hunted over Dartmoor and with the Tiverton Staghounds. We then turned our hand to show jumping and dressage, representing our riding club in area qualifiers and did a couple of local ODE’s and team chases with some success. 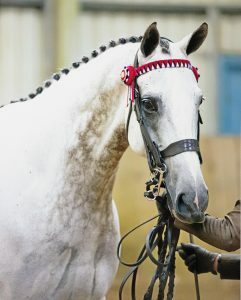 We have both competed at the National Side Saddle Championships four times including jumping, being placed each time. 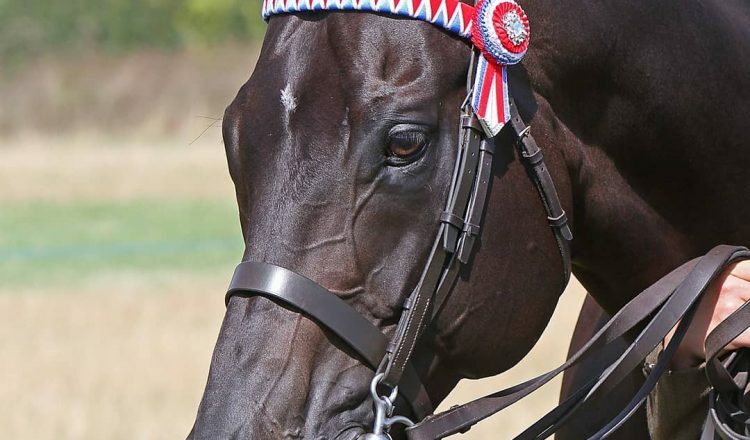 He has done BD dressage up to elementary, competing at the PP Area Festival in 2014 and 2016 and being placed at the RoR Dressage Championships in 2015. We have also had fun at RoR camps and clinics. He has spent the last couple of years being nanny to my young former racehorse, teaching him all his naughty habits! But came out of semi-retirement last month to win the veteran class and be 2nd in an ex-racehorse class at our local show, showing them how a gallop should be done at the age of 20 years old !! Sam’s racing career ended after sustaining a life-threatening injury but that hasn’t stopped him. After being nursed back to health by his wonderful trainer he has never looked back. 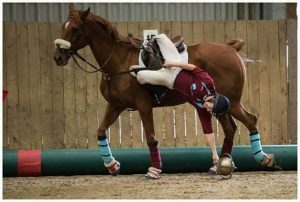 He plays horseball in the National league and also represented GB Internationally over in France. 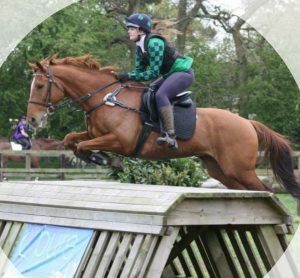 He attended the RoR championships doing dressage, he plays polocrosse, has been jousting, won out showing, been part of Recycled Racers Team Quest, led the racecourse to racecourse RoR ride and proved extremely tolerant in fancy dress as Shrek! 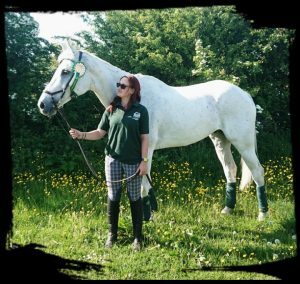 There would be fewer horses registered that have attended a more diverse selection of RoR clinics, events and have a go days! Most importantly he was the only horse I trusted to get back on after my own accident where I nearly lost my arm and without him I do not think that I would still be riding. 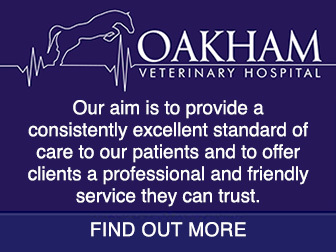 Recently we attended the 20 mile Newmarket Heath ride where he galloped like the wind up the racecourse but walked and trotted on the buckle the rest of the time. Everyone said that I was mad going all that way on my own but with Big Sam, you’re never alone. 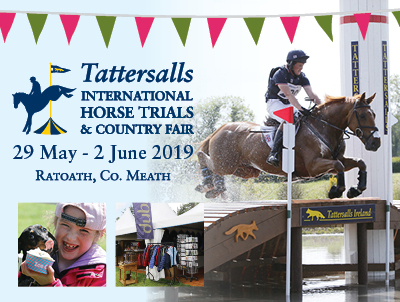 We have owned Donald for 16 years and in that time he has competed at BE eventing, having won 15 times and placed a further 38 times with both my sister, Tania and myself. He has also got BD points and BS prize money. 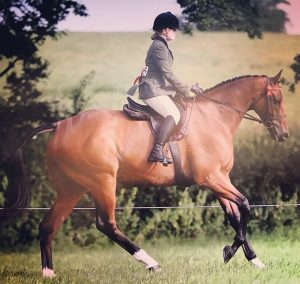 Over the last couple of years he has taught my partner, Victoria to ride and she now regularly competes on him at riding club competitions and takes him on farm rides. Just over 12 months ago I was diagnosed with cancer, and during my chemotherapy although I felt so ill and was completely bald, my treat before each session was a ride on Donald around the local farm ride. This made my treatment more bearable and he was so good with me, my balance and strength was at an all time low and he always behaved perfectly and was my rock. I don’t think we will ever find such a versatile horse again, he is our horse of a lifetime. Seraph and I met through fate, somehow I found his number and went to see him, a ribby ex-racer I immediately fell in love with. We went for a hack, I said he is the one and the rest they say is history. He was 7 and I was 14, ready to take him to pony club, what an amazing versatile animal, my best friend. A few years in I went to get him in and he couldn’t walk, Seraph had broken his leg, the vet came, x-rayed him and nothing was seen, he was then cross tied to be on the safe side and two weeks later had another x-ray, there it was, a hair line fracture on his front leg. Two and a half months in I unclipped one of his ties to get his buckets out, literally in seconds he had dropped to the floor, he laid there groaning, my heart broke, I burst into tears, and thought the worst. Little did I realise he was just exhausted from standing for so long. Then what felt like forever, he got up. What a relief, I tied him instantly and reassured him, whilst smothering him in tears. Three-months of cross tying and many tears later, full of anxiety the vet was back, re-scanned his leg and he was given the all clear. One long rehab programme later and months of getting his head back to normality, my best friend had made it. To the other side and back to competing. Seraph went on and competed in all PC, RC teams and affiliated BE bringing home many rosettes, he is now 18 and is living a super happy retirement in the field with his pals, still my best friend and my absolute horse of a life time. 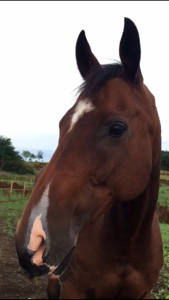 Blue is a 15-year-old former racehorse who was bought from a field over five years ago. At the time he was skin and bone to look at, he had abscesses in his feet and had rain scald. When we first started with Blue our main aim was lots of TLC. Once he started to recover and we focused on ground work and building trust. After a year, Blue started to look in better condition and was more trusting on the ground. We then began to work under saddle with him. He was terrified of the school and on hacks. He was always worried that he wasn’t doing his job properly, yet he was so eager to please. We established a clear routine to make him feel safe and settled in the school. On hacks we only asked enough to build his confidence and gradually extended the route over time. Two years on we had three secure and even paces and were in a much fitter condition: we decided it was time to take Blue to his first show. It was a disaster! He was a nervous wreck. Undeterred, we decided to try again and so our competitive career began. For our first year we mainly participated in unaffiliated dressage shows. Now five years on, we have qualified for Area Festivals, British Dressage Championships, Thoroughbred Championships and RoR Championships. 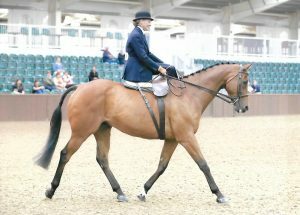 This year Blue achieved a 2nd and 3rd place at the RoR Championships for both Prelim and Novice level. Blue has grown from rescue to reserve champion! He is an amazing horse with lots of grit. He constantly raises the bar to new heights with each new challenge. He really is a diamond in the rough. Until contracting strangles in October 2016 Chilli Boy had never been sick or sorry. I always thought he was fairly tough for a thoroughbred but, following that bout of Strangles he needed to prove just how tough he was. He was recovering well. The abscesses had healed, the snot had gone and he was looking more cheerful until I arrived at the yard one evening to find my boy with all his limbs swollen, refusing to move. After the diagnosis of Purpura Hemorragica and seeing the vet six days running I was faced with the awful prospect on Christmas Eve that the vet would be with us at 6pm the following day (yes, Christmas Day) and we’d have to make the decision to put Chilli to sleep if he wasn’t showing any signs of improvement. Luckily he’s tough, he’s a fighter and my Christmas present that year was Chilli starting to look a bit brighter and starting to fight! The illness had made all of Chilli’s limbs swell as he haemorrhaged internally and he had dropped all of his weight. I wondered if he’d ever fully recover and vowed that if he never worked again it wouldn’t matter if he was alive. Two years on Chilli’s fully recovered. 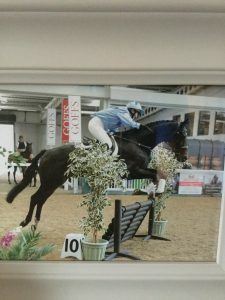 I didn’t expect anything yet we’ve been to several camps, are back doing dressage (competing as part of an RoR team) and even jumping sometimes. I really can’t believe the horse I thought I was going to lose will celebrate his 21st birthday next March. 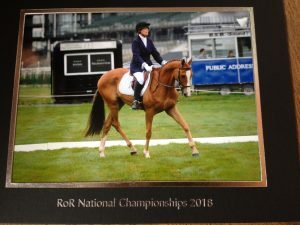 Blue finished racing in summer 2017 and began retraining in 2018 to qualify for the Aintree Novice at Doncaster on his first outing, and followed this up with multiple red rosettes, including most recently three wins at NCPA POYS Championships. In such a short time, he has proved to be a heart throb on social media and with judges, and as a result the name ‘Blunicorn’ developed – he really is only missing the horn! As an RoR judge, I am particular about correct conformation and good movement, and when I first laid eyes on THAT head, it was love at first sight! He is the epitome of a Thoroughbred. Blue has: a benevolent eye; a model’s face (good enough to win him a bridle competition last month); an impressive length of rein and carriage; depth and substance with one of the best second thighs and quality bone I have seen in a TB, and he is an eye-catching dapple grey. He is a real life version of an antique dappled rocking horse that I have forever dreamed of owning, and now in adulthood, I am blessed to start my day seeing a real life one: his pink snip, pricked ears, hearing his hoarse wicker greeting and sitting on that rocking horse canter! Moreover, he has blossomed in 12 months from a severely lean and distant 16.2hh frame to a loving tank who adores cuddles, grooming, human attention, learning and friendship: he is beautiful both inside and out, and I couldn’t imagine life without him! Steel Rain (Jack to his friends) is the George Clooney of the horse world. Tall (well, 16 hands…..) dark and handsome with chiselled features. With mirror like shine to his coat, he truly is my real life black beauty! I’ve had the pleasure of knowing Doc for four years now and in that time he’s had many ups and downs. Like many former racers he’s had injury after injury and is full of lumps and bumps and scars but that doesn’t stop him from being the handsome boy he is. Just over two years ago he lost a massive nine stone in weight due to stress from moving to a new yard. He has since put it back on with a lot of work and good feed and is looking super strong and handsome today. I think he deserves to win because he works so hard every day and hasn’t had the chance for his showing career to take off just yet due to injury and stress, so he deserves to end the year with a little award for being the handsome guy he is. 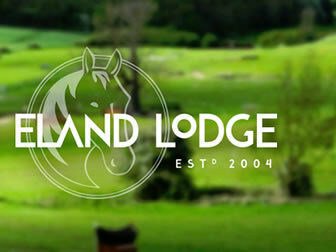 Hopetoun to host two Equine events in 2013.